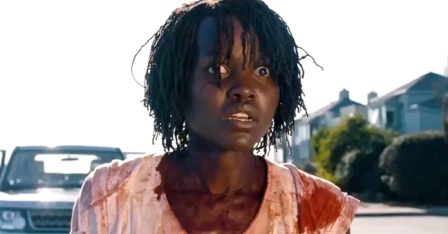 ‘US’ — Jordan Peele’s New Horror Film Looks at the Evil, Within! It’s challenging to review “US” since there are many spoilers that occur in the first ten minutes of the film. It’s being positioned as a horror film that is working on layers with sharp allegories that focus on the countries growing, racial tensions. I'll buy that, for now. In this “horror” film you think much more than “scream” which might be exactly what the very intelligent Peele wanted all along. Maybe he wanted to creep into our minds and stay there for a long, long time? In his second feature, which he described in a video message as an example of “Black excellence” he delivers the film with fully loaded nightmare-inducing images of tunnel-dwelling, bloodthirsty döppelgangers who’ve come to claim the privileged lives their “aboveground” counterparts have been enjoying without an ounce of gratitude. The film arrives in a shroud of secrecy and the less you know going in about “US” the better you will feel. Their marketing plan is almost (almost) as confusing as the film. Example, once you've have experienced the film the filmmakers are encouraging a conversation online but again — without giving away key spoilers — what kind of meaningful conversation can any viewer really have? Let me answer, none …. “US” begins with young Adelaide wondering away from her parents in an amusement park during a trip to the Santa Cruz boardwalk. She's eerily attracted to the beach and keeps walking toward the great unknown. She takes a detour into a funhouse and there something happens while the youngster is exploring the hall of mirrors: During a storm, the power goes out, and she comes face to face with something more than her reflection. Set in 1986, this encounter unhinges Adelaide so deeply that she suppresses the memory for over 30 years — which is exactly where the film picks up, in the present day. All grown up, Adelaide (Lupita Nyong’o) is now happily married to Gabe Wilson (Winston Duke) and the mother to two kids Zora (Shahadi Wright Joseph) and Jason (Evan Alex). The families best friends are Josh (Tim Heidecker) and Kitty Tyler (Elisabeth Moss) who have twin teenage girls. It’s interesting to note that their friends are rich and White. They are all heading back to Santa Cruz for their summer vacation. Flash forward to tomorrow’s headline and I’m confident that “Americans” will still be spending a lot of time worrying about what the “other” people are doing or not doing in this country. And by other, I mean immigrants, unfamiliar races, and African Americans. “They” are so concerned about the “others” that they give little thought to the one percent that actually run the entire world. It’s too scary a thought while looking at your own reflection to imagine that you are a slave, a clink in the machine, useless and utterly replaceable. You’ve seen the scene in the trailers, where the youngest, Jason, peering out of the window announces that “There’s a family in our driveway” an innocent statement that is actually a declaration of war. The terror that the unwelcomed family, mother, father, daughter, and son is about to unleash on the Wilson family is just about to begin, when Adelaide calls the cops, only to find that it will take 14 minutes before they will arrive. Gabe steps up and does the manly thing, stepping outside to have harsh words with the unwelcome family which doesn’t leave. In a split second, the assault begins and it never lets up. An interesting note, the Police never arrive so when the N.W.A.’s classic song “F— tha Police” starts playing over a crucial scene we get the full weight of the situation. Let’s turn to the visuals, Peele directs each horrific setup with just the amount of tension to make horror fans shriek with delight. He creates excellent tension with images that are so simple yet heart pounding like the four figures holding hands, standing atop a dark driveway, the stuff of nightmares as the real Wilsons realize the situation is dire. The danger is palpable, and under Peele’s eye, he fills every frame with meaning. What really makes the film truly a horror film is that “US” makes monsters out of everyday people. Peel uses the image of the 80’s Hands Across America campaign as an evil clone origin and he opens with a title card explaining that there is a maze of underground tunnel systems right under our feet across the U.S. if not, the world. Like in most horror films, there is very little explanation on the evil families origin, Peele lets the viewer's imagination create our own worst fear scenario. To keep it simple, its only Nyong’o’s döppelganger that can speak but her words come out very strained. The Tethered seem to communicate using guttural animal noises and supernatural instinct. There are many things in the film that don’t seem “right” that frankly would fail a logic test. One is the suggestion that these “nonverbal” Tethered have been cleverly manipulating us all along, really, how? And that these beings can anticipate a human being every move, and beat us at every turn, again, really, how? Desperately trying not to share any spoilers, it’s hard to comprehend that the non-verbal Tethered seem to have become a deadly killing machine, knocking off a large part of the country, but not the Wilson family. How’s possible? Not taking anything away from our Black family, they fight for their lives using golf clubs, fireplace pokers, baseball bats and other blunt objects. And just like Black people in this world, we are very, very, very hard to kill. Here’s what I don’t love, when Peele attempts to explain the Tethered masterplan (What?) taking us deep into the belly of the earth where the last, big fight for survival is waged. To keep the spoilers away, I can’t dive into the what Peele may or may not mean in taking us underground. Is it an elaborate metaphor? Did he create this too helps us connect to a sinister domain as a visual allegory, exploring the darkest aspects of our own civilization? Is he forcing us, one last time to be brave when ­confronting the ­monsters ­within each of us? I don’t know? I doubt after watching “US” that you will have an answer, either. A Universal Pictures release, presented in association with Perfect World Pictures, of a Monkeypaw production. Directed and written by Jordan Peele. Starring Lupita Nyong'o, Winston Duke, Elisabeth Moss, Tim Heidecker, Yahya Abdul-Mateen II, Anna Diop, Evan Alex, Shahadi Wright-Joseph, Madison Curry, Cali Sheldon.